Here’s how to add a line, pattern, or custom border to a text box, picture, and other objects in Word, PowerPoint, or Excel for Mac. 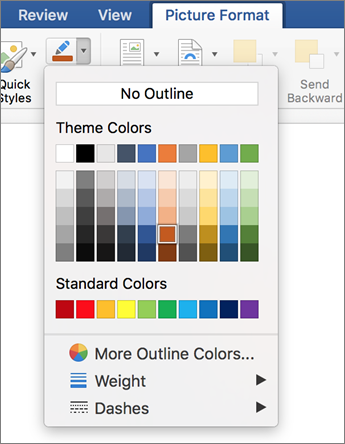 Note: If you didn't add the border to the shape, text box, picture, or other object in Mac Office, you can't change or remove the border for the object. Select the shape or text box to which you want to add, change, or remove a border. Click Shape Format, and then click the arrow next to Shape Outline. 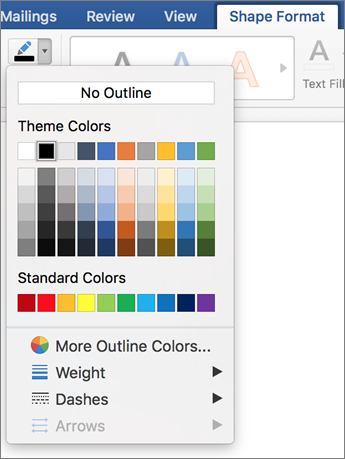 Either click the color that you want, or mix your own color by clicking More Outline Colors. Point to Weight, and then choose the line weight that you want. Point to Dashes, and then click the line style that you want. Select the picture to which you want to add, change, or remove a border. Click Picture Format, and then click the arrow next to Picture Border. Either click the color you want, or mix your own color by clicking More Outline Colors. Point to Weight, and then choose the line weight you want. Point to Dashes, and then click the line style you want. Select the shape or text box that you want to add a border to. On the Format tab, under Shape Styles, click Line. Either click the color that you want, or mix your own color by clicking More Colors. Point to Weights, and then choose the line weight that you want. Point to Dashed, and then click the line style that you want. Select the table that you want to add borders to. On the Tables tab, under Table Styles, click the arrow next to Lines, and then either click the color that you want, or mix your own color by clicking More Colors. On the Tables tab, under Draw Borders, click the Line Weight pop-up menu and choose the thickness that you want the borders to be. On the Tables tab, under Draw Borders, click the Line Style pop-up menu, and choose the line style that you want the borders to have. On the Tables tab, under Draw Borders, click the arrow next to Borders and then select or clear the table borders that you want. Select the picture that you want to add a border to. On the Format Picture tab, under Picture Styles, click the arrow next to Border .